William Witney had a long career in Hollywood, directing films and TV shows for nearly 50 years. While he’s remembered best for some of the serials that he co-directed with John English, he also had a hand in making some westerns, directing nearly two dozen of them. Late in his career, in 1965, he helmed Arizona Raiders, which is a remake of 1951’s The Texas Rangers. Arizona Raiders tells the story of a confederate war hero, Clint Stewart (Audie Murphy), who goes rogue and joins a ruthless gang of outlaws called Quantrill’s Raiders, led by Quantrill himself (Fred Graham). After being captured by the military, Clint and his fellow outlaw Willie (Ben Cooper) are offered a deal by U.S. army captain Andrews (Buster Crabbe) to reinfiltrate Quantrill’s Raiders, inform the captain of their whereabouts, and assist them in capturing any remaining members. After the Raiders kidnap an Indian princess named Martina (Gloria Talbot) and hold her and her tribe hostage, it isn’t long before Clint and Willie find themselves in a dangerous and uncertain situation that could lead to their deaths. Arizona Raiders is a decent B western, more or less run of the mill with nothing that really stands out. Even the presence of screen legend Buster Crabbe, known for his timeless roles as Flash Gordon, Buck Rogers, and Tarzan, can’t improve it. Everyone hands in fine performances, but Gloria Talbot, who many may recognize from The Cyclops, Alias Jesse James, and Girls Town, feels miscast, looking a bit ridiculous as a Native American tribeswoman. William Whitney, who co-directed the serials Daredevils of the Red Circle and The Adventures of Captain Marvel, ultimately failed to reach the same level of thrills and excitement with this picture. 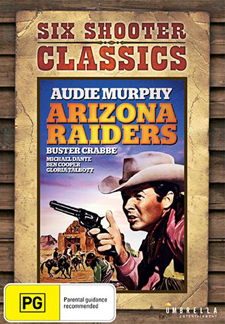 Umbrella Entertainment releases Arizona Raiders on DVD as part of their Six Shooter Classics series. Presented in standard definition and letterboxed in its original 2:35:1 aspect ratio, the picture looks really good with crisp, clear images. Daytime scenes are sharp, with beautiful shades of blue, brown, and green, as well as balanced blacks. There are a few speckles here and there, but it’s a solid presentation overall. One can only imagine how much better it would look in high definition. English 2.0 mono Dolby Digital is the only audio option, but it comes in strong with more intensity during shootouts or Richard LaSalle’s musical score. No dropouts or other issues are detectable. Sadly, there are no extras. For those who are die-hard, western aficionados, Arizona Raiders is certainly worth a spin as it features a decent presentation, but it could have included a trailer or two, perhaps promoting other titles in the Six Shooter Classics line.